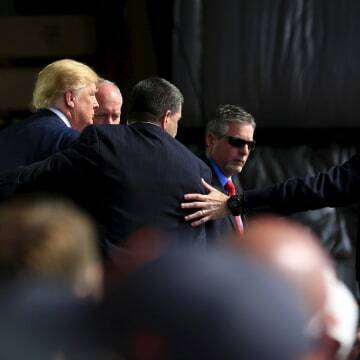 A Donald Trump rally took a dramatic turn Saturday when a disturbance broke out behind him — causing Secret Service agents to jump on stage and form a wall around the candidate amid the commotion. A campaign spokeswoman said that a man at the Dayton, Ohio, event "attempted to breach the secure buffer and was removed rapidly and professionally." The suspect was identified as Thomas Dimassimo, 32, and was charged with disorderly conduct and inducing panic — both misdemeanors, Chief Mike Etter of the Dayton Airport Police Department told NBC News. Dimassimo jumped the bike racks and tried to climb onto the stage, but was stopped by Secret Service stationed there, Etter said. He was being held at the Montgomery County jail in Dayton. The suspect may have thrown a bottle at the start of the incident, Etter added, but that wasn't immediately clear. 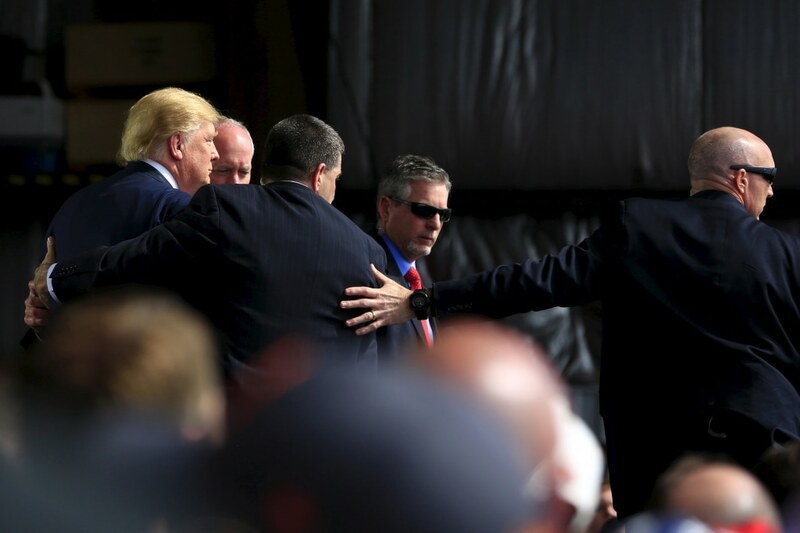 One Secret Service agent sustained a minor injury to the nose, police said. As the suspect was ousted, the audience cheered "Trump," and the barely fazed billionaire gave two thumbs up and quipped: "I was ready for him, but it’s much easier if the cops do it." 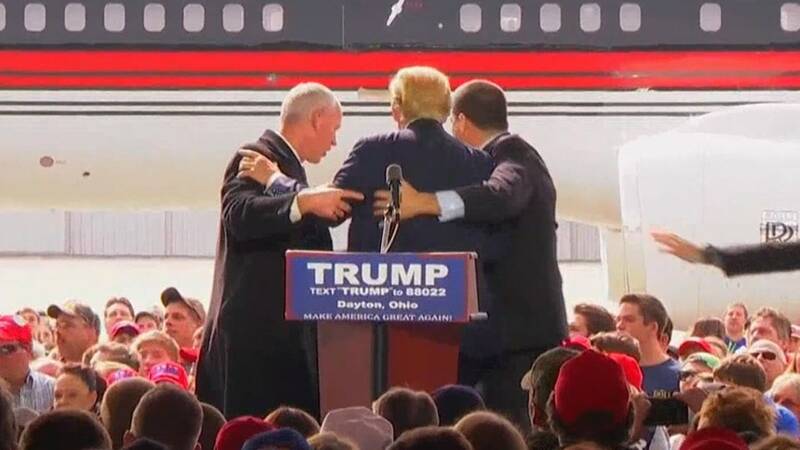 It was the first time at one of Trump's events that agents had to swarm the stage in such a manner. The incident happened a day after Trump canceled a rally in Chicago as hundreds of protesters waited for him, leading to scuffles between them and his supporters. 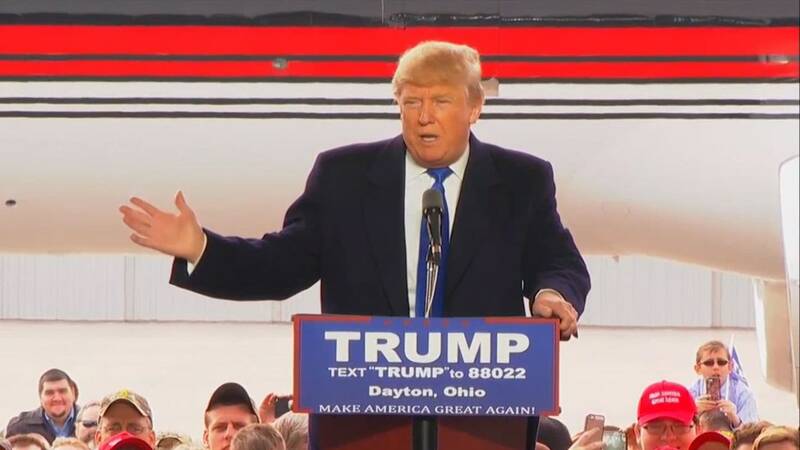 Earlier in the rally at Dayton International Airport, the Republican front-runner said he "didn't want to see anybody get hurt" at Friday's highly charged gathering at the University of Illinois-Chicago. "You would have had a problem like you haven't seen in a long time," Trump said. "It was determined that if we go in, it could cause really bad, bad vibes." Five people were arrested and two officers were injured amid the clashes, police said. "All of a sudden, a planned attack just came out of nowhere," Trump said of the protesters, whom he accused of carrying signs "printed by people that were professional people ... very professionally done. A disgrace, if you want to know the truth." After consulting with law enforcement, Trump said he decided to cancel what would have been a "tremendous" rally. "We want to get along with everybody. But when they have organized, professionally staged wiseguys, we've got to fight back," he said at his Ohio campaign stop. 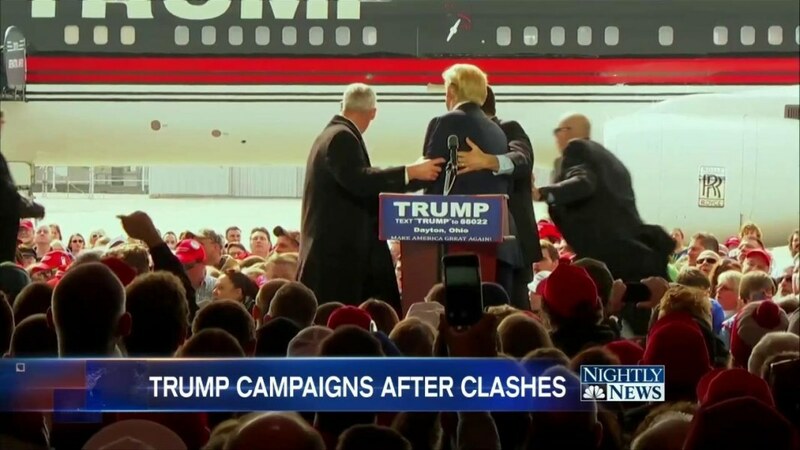 Trump is under scrutiny for violence at a number of his rallies in the past week: The Chicago skirmishes came after a man was charged with assault for punching a protester at a Fayetteville, North Carolina, event Wednesday night, and Breitbart reporter Michelle Fields accused Trump campaign manager Corey Lewandowski of yanking her arm aggressively when she tried to ask the candidate a question Tuesday night. Marco Rubio slammed Trump Saturday, warning that violence "is what the Republican Party's going to be defined by" if Trump is the nominee. "This is what a culture and a society looks like when everyone goes around saying whatever the heck they want," Rubio said. "The result is, it all breaks down. It's called chaos. It's called anarchy. And that's what we're careening towards." Hours earlier, Trump defiantly tweeted: "The organized group of people, many of them thugs, who shut down our First Amendment rights in Chicago, have totally energized America!" The protesters were "bad people," he said Saturday. "These are people who truly don't want to see our country great again." Trump, who was introduced in Dayton by New York Jets center Nick Mangold, touched on a variety of other issues at the rally, including his plans for bringing more jobs to the U.S., fighting ISIS, and illegal immigration. "Our border's like a piece of Swiss cheese. People just come pouring in," he said. Later Saturday, Trump held another rally in Cleveland, which was punctuated by multiple protesters. "That's a Bernie [Sanders] person, it's a Bernie person," Trump said, pointing to a protester. "Get that Bernie person out of here."